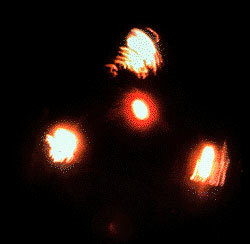 From October 1989 throughout 1990, hundreds of reports of lighted objects, frequently described as enormous and triangular in shape were recorded in Belgium. Air Force supersonic F-16 jets chased these strange objects, which were simultaneously tracked by both airborne and ground radars. The Belgian Government cooperated fully with civilian UFO investigators, an action without precedent in the history of government involvement in this field. 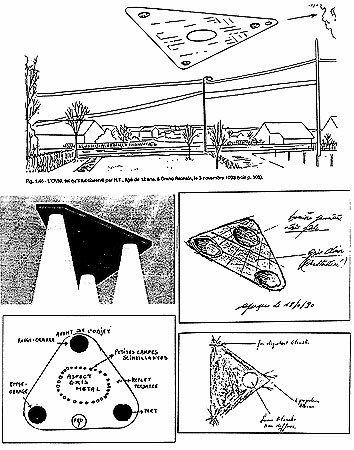 Montage of eyewitness drawings and reconstructions of triangular craft seen in Belgium between 1989 and 1993. Sightings continued to be logged by SOBEPS and the Gendarmerie during the fall and winter of 1989-1990. 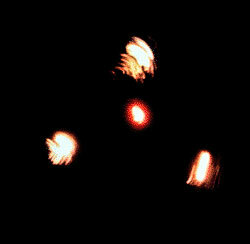 Most witnesses described seeing dark, triangular objects with white lights at the corners and a red flashing light in the middle. Many of the objects were said to have hovered, with some of them then suddenly accelerating to a very high speed. Most of the objects made no sound, but some were said to have emitted a faint humming like an electric motor. 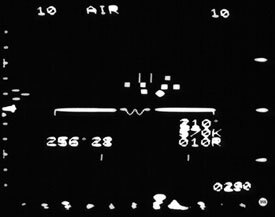 Public interest in the wave reached its peak with a radar/visual and jet scramble incident on the night of March 30-31, 1990. This scramble was seen and reported by hundreds of citizens. A preliminary report prepared by Major P. Lambrechts of the Belgian Air Force General Staff was released to SOBEPS. The "Report concerning the observation of UFOs during the night of March 30 to 31, 1990," includes a detailed chronology of events and dismisses several hypotheses such as optical illusions, balloons, meteorological inversions, military aircraft, holographic projections, etc. 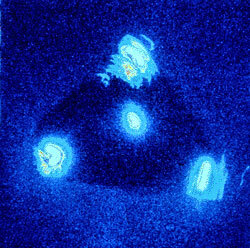 Two computerized radar images of the UFO tracked by an F-16 fighter. Apparent trajectory of the UFO, from the technical Gilmard-Salmom study of the Royal Belgian Air Force. Trajectory of the two F-16's. Although many aspects of this case still remain unexplained, Meessen and SOBEPS have basically accepted the Gilmard-Salmon hypothesis that some of the radar contacts were really "angels" caused by a rare meteorological phenomenon. This became evident in four lock-ons, "where the object descended to the ground with calculations showing negative [emphasis added] altitude... It was evidently impossible that an object could penetrate the ground, but it was possible that the ground could act as a mirror." "What impressed me the most were the witnesses, some of whom I know personally and convinced me that, in fact, something was going on. These were credible people and they told clearly what they saw. "Irregular displacement (zig-zag, instantaneous change of trajectory, etc.). "Displacement following the contours of the terrain. "Varying speeds of displacement (including very slow motion). 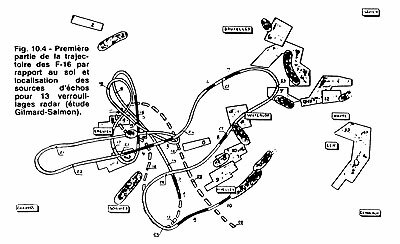 "Overflight of urban and industrial centers. 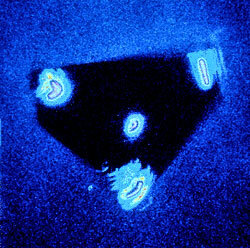 Because the bulk of the Belgian sightings described triangular-shaped objects, many European and American researchers and journalists speculated that these were caused by either F-117A stealth fighters or some other revolutionary U.S. secret military aircraft. However, the only truly unusual characteristic of the F-117 is its near-invisibility to radar and infrared detection - it looks, flies and sounds like any other sub-sonic jet airplane. Similar claims about the presence of other American advanced airplanes are even harder to substantiate: the A-12 Avenger II was never built, and the existence of the TR-3A "manta" is unconfirmed. Neither has even been rumored to be able to fly in the manner reported for the Belgian UFOs. Computer enhancement analysis made at the Royal Military Academy by Prof. M. Acheroy. Despite the fact that the secret military aircraft hypothesis has been denied officially over and over again by the Belgian Ministry of Defense and Air Force, as well as by the U.S. Embassy in Brussels and the U.S. Defense Intelligence Agency, some publications continue to champion the stealth fighter theory. 133. SOBEPS, Vague d'OVNI sur la Belgique - Un Dossier Exceptionnel, Brussels 1991; Vague d'OVNI sur la Belgique 2 - Une Enigme Non R�solue, Brussels, 1994. 134. 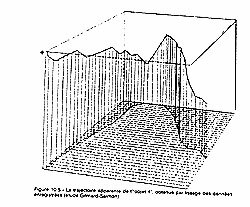 Meessen, Auguste, "Observations, analyses et recherches," Chapter 10 in Vague d'OVNI 2, ibid. 135. Lambrechts, Major P., "Report Concerning the Observation of UFOs During the Night of March 30-31, 1990," preliminary report dated May 31, 1990. 137. Huneeus, A., telephone interview with Major General De Brouwer, October 5, 1995. 138. Valckenaers, Marc, "Etude des particularit�s remarquables," Chapter 2 in Vague d'OVNI 2, ibid. 139. Marhic, Renaud, "Ovnis belges: nouvelle rumeur," Ph�nom�na No. 13, Jan./Feb. 1993, SOS OVNI, Aix-en-Provence, France.